Umer Khan teaches English Literature at Government College University in his hometown of Lahore, where he also makes music as dUCK, and with his band, Poor Rich Boy. When he grows up, he wants to be Tintin. By that time it was clear as day that survival beyond, say, ten days would be impossible or at the very least extremely painful. By day fifteen, you’d be a sort of gooey, meat smoothie in a wrinkly bag, leaking plasma as you sloshed around distastefully towards oblivion. They say that in those last moments before death, as the mind begins to relinquish its hold, nothing feels more necessary than to stare at a human face. It is difficult to say whether everybody felt this desperate impulse to take with them something of this world, something that bound them to this experience. The prospect of perpetual nothingness spreading out into eternity seems such a cold and lonely one that in their last moments the dying gladly stare even at a stranger’s face. To see compassion, perhaps even love, in the eyes of a fellow man, and then to not attempt to keep it with you forever, seems an awful waste. Where will we ever see such a beautiful thing again? The Government stopped pretending­­ – or just generally, it stopped being a bother. It, that is to say the Government, stepped down from the position of a vaguely unsettling abstraction and became people again. The security guards, the cooks and drivers, the office staff, clerks, and all the workers went home, turning their backs on politicians who kept opening their mouths to speak but couldn’t find anything to say. Bureaucrats were completely ignored until they too stopped. It was pointed out with odd, grim hubris how it took an apocalypse to bring this most desirable change about. I suppose that at the root of it was the fact that money was now just as valuable as cooking pot tops. Actually, no, it was less sonorous and, really, of no worth at all. I mean, of course, it had always been rubbish, but we stopped pretending otherwise, you see, and that made all the difference. And yet, admittedly, it made no difference at all at that juncture. Nevertheless, there were still some people who continued with business as usual and that was just their way of dealing with the immensity of the situation. Every now and then you would see a traffic warden helping out just because. And for the first time in years, there were no doctors either without work or out on the Mall Road, blocking traffic and protesting unfair salaries. You would assume incidents of mass looting or of bearded salesmen going door to door, pushing God’s will and so forth, but no, not really. There was probably some of that here and there but by and large, if anything, people became less certain and, therefore, needed time to think. and then to not attempt to keep it with you forever, seems an awful waste. Where will we ever see such a beautiful thing again? One of my best sisters went to a room that wasn’t in some ways at least even in our house, and did not say why, did not come back, did not laugh either. How do I even begin to explain this? I imagine there were throw pillows and colour, but that could not possibly be true, since I went there and there was only a petulant shadow spreading its arms and lengths over all things, as if to say, “mine!” It conveyed nothing except, “you must swallow my pride!” I went up there with my friend and we met a man who sniggered, an older cousin who knew exactly who we were, once we told him who we were, and who got it all wrong for a joke. He had sagging bulges of fat and smoked chains of cigarettes. At that point it was OK. It did not really matter what you did. I myself played a cooking pot top – much to my father’s chagrin – to great effect, once the skin on my tabla vanished. We sat there in that room, talking about this and that, waiting that interminable wait for the inevitable sickness to set in, waiting for symptoms to become manifest. It was rather like waiting for a drug to begin its effect ­– the nervous excitement that entails being very aware of your own breathing and sensory experience, when somebody said we should probably go see what Mother was up to. We found her strolling in the garden at night. She met us with all good humour and smiles, and with parched lips said she wanted to go to the park. Since that was where I was headed anyway, it worked out well. less sonorous and, really, of no worth at all. There were many veiled and sweatered women in the park, walking in the Brownianest of motions. Identically attired, they were trying to be as disconcerting as reflections. I enjoyed their cheerful lady-sized steps as they traversed and conversed in “hello” and “hello” and were all exactly the same. That was the first time I realized that in every woman’s closet there must be at least one ensemble that every other woman also owned. This thought, I immediately realised, could’ve been articulated so much better, but it wasn’t supposed to become an aphorism. Aphorisms had failed. I remember watching some young people drag a man all the way to somewhere, held aloft between two motorcycles, like so, spread-eagled. It seemed almost as if he were being helped over a puddle by circus clowns. They wanted to get him somewhere nice before he was completely drained. It was nice of them. Their method brought about his end quicker though. 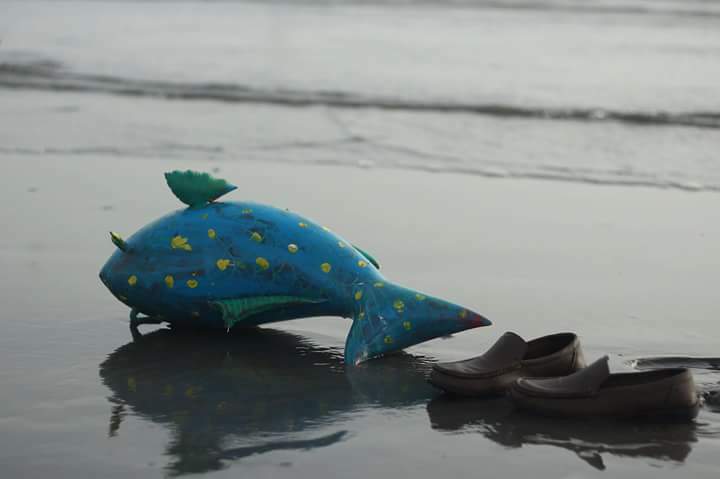 “One hundred dead fish” by Arsalan Nasir. 2017. Acrylic paint on HDPE plastic and air blown. Size: variable. Interactive installation at Clifton beach. I was always a little concerned about being stopped or asked questions by some of the more resentful young people – but we drove in our lane and we turned when we were supposed to, my mother and I and Driver. There was not much traffic. A fast car would pass us by like an arrow. But it meant nothing except a peculiar kind of lonely. It was just silly. And I tried not to make eye contact. We were off to Grandma’s house to watch her die. Perhaps, and it is quite odd to think of it, but my sister’s self-exile into the unroom was what made me feel that the entire planet was marked by a profound sense of loss. Or perhaps that was just the apocalypse. She wasn’t angry at us or anything like that. That is, or was, I suppose, how she wanted to spend her time. Time then was quite unequivocally hers. Perhaps that is, or was, what she had actually wanted. She was finally free. I am almost certain she caused all this. She hated living with him so much she might have willed the end of days. But there he was with his bulges of fat and his chains of cigarettes. somewhere would suddenly wake up and the nightmare would be over. I remember staring at my mother’s fingers as her rings turned black and her nails fell out. And I won’t deny that it repulsed me and I won’t lie: I held her hand anyway. Of course I did. My father disliked the noise of the cooking pot top. But he put up with it, barely, like a bear! He was relieved when the skin had melted off the tabla, initially, but then Ustad Ji told me to sort of hold the skin and stretch it over to play on one handed – like a weaver ant holding leaves. Eventually, however, the skin just dripped liquid and so then the cooking pot top was taken out and I beat out this really nice rhythm that made Ustad Ji speak in elaborate, sexual metaphors. That, perhaps more than anything else, bothered… no, no, it was just the sound! He hated the cacophony, my father, I mean. Ustad Ji asked me to play one day, as loudly as I could, while he spilled his guts in the closet. He thought I was too young to know why I had to play as loud as I can. Let your art hide the truth’s ugliness, he said, aphoristically. He didn’t know. The identical women in the park, in their identical, periwinkle, knitted sweaters, with identical patterns and their dull grey veils, walked in Brownian motion around objects that turned, well, green. The kind that glows, that is. And nobody fought. In the last days, everyone was looking inwards and seeing out. It was patiently and desperately expected that someone somewhere would suddenly wake up and the nightmare would be over. Someone else would wake up, you see. That was the key to a good last ten days. The quietest sort of desperation. The kind that stares.